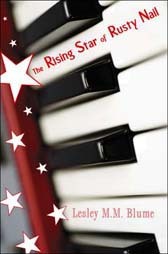 I can’t find any connection that gives a general category for the next three of my ten favorite covers of 2007. So here they are in no particular order. 1. 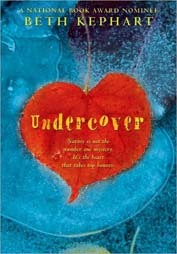 Undercover by Beth Kephart (HarperTeen) Jacket design by Chad Beckerman (interview with Chad). The image here is so beautiful. You really have to see it on the actual book. Something about a red leaf frozen into blue ice, filled with air bubbles. The photo is sharp – yet at first you don’t quite recognize what it is that you are looking at. The title text fits beautifully – both font and color. I was attracted to this book by its cover – and found that the beauty of the cover was matched by the gorgeous language inside. 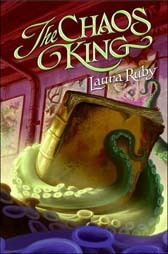 I love love this book. The image of an octopus (squid?) wrapped around an old decaying book is intriguing. But more than that, the color palette creates a surprisingly unscary mood. From the close up tentacles shadowed in purple, to the yellow of the tentacles bathed in light, to the green of the tentacles farther away – cool colors. Then the hot pink/red of the background. The title font in green stands out. And there’s more detail to make you keep looking.